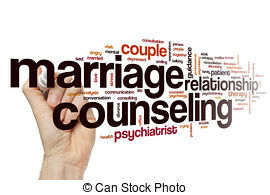 Six Misconceptions about Marriage Counseling – CounselCare Connection. P.C. 1. Counseling is ineffective. Many Christians believe that marital counseling is not effective because it is psychologically based. Thus, couples may be discouraged from trying Christian counseling that might help them and that might make a difference in stabilizing and improving their relationships. 2. Counseling is a last resort. Church leaders sometimes believe that marriage counseling is the final step before a couple makes an appointment with an attorney. This attitude often prevents couples from getting early counseling intervention that could help identify and mediate their issues. 3. Counseling undermines marriage restoration. Some Christians have a misunderstanding about counseling and feel that counselors may actually encourage divorce when couples are experiencing trouble in their marriages. This may be true with some secular counselors, but Christian counselors who are committed to applying biblical principles to the counseling process will teach couples to work at rebuilding their marriages. The important point here is that people should be referred to Christian counselors who demonstrate a commitment to scriptural teachings and marital restoration. 4. The Bible and the Holy Spirit makes counselors unnecessary. Many Christians believe that marriage restoration can only come through application of biblical principles and the power of the Holy Spirit. It is true that the Bible is God’s authoritative revelation to man for knowing Him and showing how to live as a Christian. It is also true that God has provided godly counselors, other resources, and practical skills for building relationships. Many problems that couples struggle with are not specifically addressed in the Bible such as in-law problems, abuse, and power and control issues. There are biblical principles that need to be applied, but examples of what to say and how to speak the truth in love for specific situations are hard to find. A wise counselor can help couples identify issues, communicate effectively, and work through problems in a positive and practical way. Couples will benefit when they utilize helpful resources and skills found in books written by Christian authors. 5. Counseling is a “magic pill” solution. Pastors and Christians may believe that they cannot help people with marital trouble and that professional counseling is the “magic pill” solution for helping couples change. This thinking comes from feelings of inadequacy. The truth, though, is that many couples have been helped through seminars, pastoral intervention, guidance, and application of God’s Word. It is important to use all the resources and godly professional counselors available to restore marriages. 6. Pastoral counseling is the same as marital counseling. Christians may not be aware that pastor education and counselor education are often different. Christian marriage counselors are trained specifically in marriage counseling from a biblical perspective. Pastors, on the other hand, are trained mostly in theology, education, missions, Bible, and doctrine. Of course, some pastors do take required or elective courses in pastoral counseling. Pastors do play a critical role in providing spiritual guidance to troubled couples and praying for them. Couples can greatly benefit from their intervention and counseling. Pastors and counselors should network and be involved together in helping restore broken marriages. Lynette J. Hoy is a National Certified Counselor and a licensed, clinical professional counselor in the State of Illinois. Considering Marriage Counseling in the Chicagoland area? Copyright © 2017 by the author and/or CaringChurches.com and The Church Initiative, Inc. unless noted otherwise in the text of the article above.